Oh boy, was this a BIG wine! Dark purple color, very nice. Intense aromas of tobacco, peppered roasted meats, dark fruits and milk chocolate mixed with an alcoholic burn that flamed my nostrils. More bigness (is that a word?) on the palate, with a rich, lush texture. Plenty of the same flavors in the mouth as in the aromas, along with smooth tannins and enough backing acidity to keep it from being flabby. Lengthy aftertaste. And the alcohol. There's so much extract in this wine that it does a pretty good job of masking the alcohol but nevertheless, it can't hide it completely and it comes out not only in the aromas but in the finish. 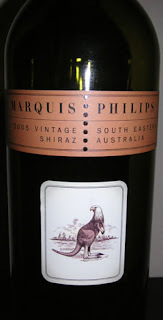 This 2005 Shiraz from Marquis Philips is certainly not shy! At $11.49 from Costco, I give it two thumbs up because of the price and for having so much flavor. The alcoholic burn still bothers me, though, and at higher price levels my thumbs would begin to rotate in a different direction. Cut from the same mold as the Sarah’s Blend, the inky/blue/purple-colored 2005 Shiraz offers up sweet, rich aromas of blackberries, toasty wood, licorice, and a touch of pepper. This dense, opulent, fleshy, full, rich, mouthfilling, concentrated Shiraz should drink well for 3-4 years. 91 pts. I like your review better. Thanks, Jill! I just calls 'em as I drinks 'em, lol. I didn't sense any licorice, but the part about being "dense, opluent, fleshy, full, rich and mouthfilling" I agree with except perhaps Mr. Parker was understating the case. He forgot to add "alcoholic wallop!"